Furious Kaliro residents bar MP Margaret Mbeiza from addressing them. Photo by Raymond Mayanja. KAMPALA – The Kampala Capital City Authority Councillors under the guidance Lord Mayor Erias Lukwago meet this Monday morning to deliberate on an action plan to join efforts to block the tabling of the motion intended to lift the Presidential Age limit. The Parliament will on Tuesday, September 26th, resume its business, with NRM legislators led by Igara West MP Raphael Magyezi, preparing to bring a motion, allowing them to table a private member’s bill. But KCCA councilors, the majority belonging to FDC, the main opposition party are also not sitting. In today’s meeting, the source revealed that they are changing tactics on how they will handle the matter tomorrow. “Last week, the Police arrested our commanders, before assembling, to march to the Constitutional Square. This time, we have to change the tactics,” a source revealed. The Constitutional Square, currently, is being manned by the military and other security agents. Also, there is a heavy deployment of soldiers and the Policemen at Parliament since last week. Lukwago vowed not to surrender, adding that by Police assaulting him, he can’t be coerced to abandon his struggle against misuse of the law. 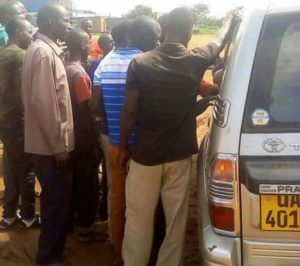 A number of politicians and Makerere University students were arrested on Thursday, as they were demonstrating against amending Article 102(b) of the Constitution. They accuse NRM legislators of amending the Constitution, to help President Yoweri Museveni to contest for the Presidency in 2021, after clocking above 75 years. The Constitution bars anyone at 75 years and above to run for the Presidency. The Police released Makerere University students, who were arrested on Thursday last week, staging a demonstration. The Police also arrested, Doreen Nyanjura, the Makerere University councilor were granted police bond. “The state couldn’t handle the pressure put up by Makerereans. To the Makerere university students and all Patriotic Ugandans who participated in peaceful demonstrations, Uganda is proud of you and history will remember you as heroes who stood up face to face with the enemy of Uganda. I implore to remain brave until the end,”Nyanjura explained. Vincent Sekatte, the deputy Police spokesperson explained that the delay to release them was because Police was still screening them and recording their statements. The issue of amending the Constitution, to handle age limit is becoming hot. Over the weekend, Kaliro District Woman MP, Margret Mbeiza Kisira, faced it wrath, when constituents, chased her away. They accused her of backing lifting the age limit. Residents of Namwiwa trading center could not allow her to speak to them. Insiders at Parliament have revealed that all the NRM legislators were given Policemen as their escorts, to avert any danger.